Story: Penny is one of the Beagle Boys' nieces. 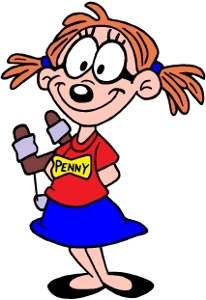 Equipment: Penny often carries a sling shot. Background notes: Penny is one of the new Disney characters from Italy. She first appeared in the story I Bassotti in: Arriva Penny in Topolino #2608 from 2005. So far, there are only three records of her appearance in comics.